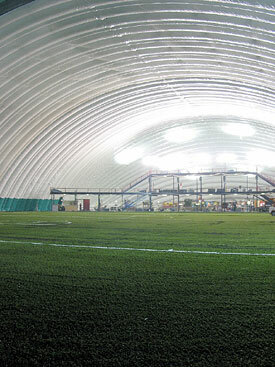 Winnipeg's only indoor golf dome provides users with over 50 stations on a three tier driving range. The path of the ball flight is very easy to see against the dark green background of the dome. Whether you are using your driver, your irons or your wedges, The Golf Dome features an "all you can hit" system where you are charged by the amount of time that you use rather than by the bucket. Challenge your neighbour to a target competition on targets placed strategically throughout the driving range. Buy minutes on the driving range at a reduced rate. These Prepaid Range Minute Cards can be shared by more than one person and are good for one year. As an added bonus, they can also be used on our five virtual golf simulators.